CNN and its chief White House correspondent Jim Acosta filed suit Tuesday against President Donald Trump, White House press secretary Sarah Sanders, the president's chief of staff John Kelly and the U.S. Secret Service, among others, over the suspension of Acosta's WHite House press credentials and demanded they be returned. "The wrongful revocation of these credentials violates CNN and Acosta’s First Amendment rights of freedom of the press, and their Fifth Amendment rights to due process," CNN said in a press release. In the complaint, filed in D.C. District Court, lawyers for CNN argued the "revocation of Acosta's credentials is only the beginning." "This severe and unprecedented punishment is the culmination of years of hostility by President Trump against CNN and Acosta based on the contents of their reporting—an unabashed attempt to censor the press and exclude reporters from the White House who challenge and dispute the President’s point of view," CNN's lawyers wrote in the court documents. A White House staff member reaches for the microphone held by CNN's Jim Acosta as he questions President Donald Trump during a news conference following Tuesday's midterm elections at the White House in Washington, Nov. 7, 2018. The president "lacks the authority to quash" the First Amendment, the lawyers wrote, and access to the White House cannot be denied arbitrarily. 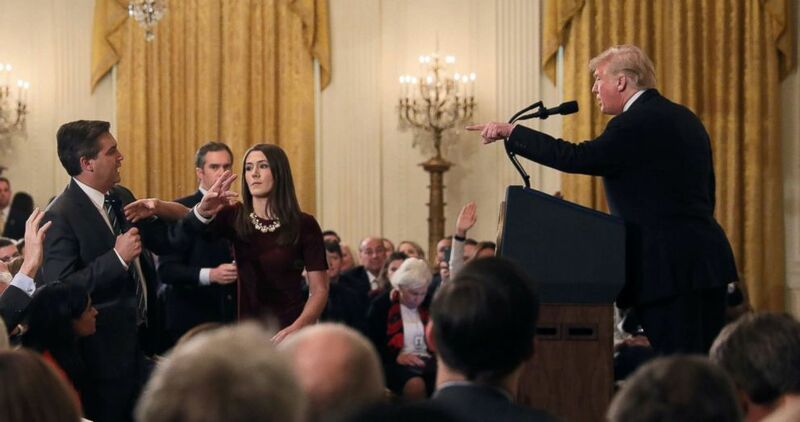 According to the lawsuit, CNN and Acosta aim to "enforce this constitutional commitment, restore Acosta’s well-deserved press credentials, and ensure that the press remains free to question the government and to report the business of the nation to the American people." Sanders, in a response from the White House, called the lawsuit "more grandstanding from CNN" and vowed to "vigorously defend" against the lawsuit. CNN has nearly 50 additional "hard pass" holders, a common name for White House press credentials, Sanders said, and Acosta is "no more or less special than any other media outlet or reporter with respect to the First Amendment," which Sanders argued is not served when one reporter "attempts to monopolize the floor." Sanders' comments Tuesday differ from her explanation last week of Acosta's press pass suspension. In her first statement on the evening of the press conference, Sanders led off by denouncing Acosta for "placing his hands on a young women just trying to do her job as a White House intern," an assertion that CNN immediately denied. In Tuesday's statement, Sanders didn't say Acosta made contact with the intern, but instead that Acosta "physically refused to surrender a White House microphone to an intern, so that other reporters might ask their questions." White House Correspondents' Association President Olivier Knox issued a statement supporting CNN's legal move, saying the White House should not have taken away Acosta's credentials in the first place. "Revoking access to the White House complex amounted to disproportionate reaction to the events of last Wednesday. We continue to urge the Administration to reverse course and fully reinstate CNN’s correspondent. The President of the United States should not be in the business of arbitrarily picking the men and women who cover him," Knox said. The White House suspended press access for Acosta after he and Trump engaged in a heated exchange during a press conference on Wednesday, one day after the midterm elections. Acosta began by asking about language the president used about a caravan of migrants from Central America, many of whom say they're fleeing violence, headed to the U.S. border. "Honestly, I think you should let me run the country, you run CNN, and if you did it well, your ratings would be much better," Trump told Acosta. Acosta then asked the president a question about the Russia investigation. After a back-and-forth, the president responded: "That's enough." A White House intern attempted to take the microphone from Acosta, who kept a firm grip and, while gesticulating, his arm came into contact with the intern's arm, according to video of the exchange. “Pardon me, ma’am,” Acosta told the intern during the encounter. When Acosta returned to the White House later that evening, the Secret Service barred him from entering and took his credentials. Many journalists came to Acosta's defense, calling the suspension of his credentials a "very bad sign" stemming from a fear of tough questioning, and tweeting photos of the exchange. Read the full complaint filed by CNN here.